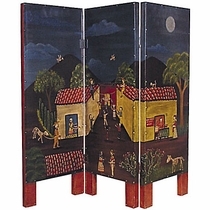 Our room divider screens with hand painted Mexican folk art scenes depicting Day of the Dead and religious themes are handcrafted and hand painted by Mexican folk art artisans. 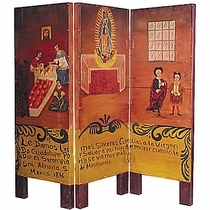 One of these room divider screens will be a colorful and authentic Mexican addition to any room. 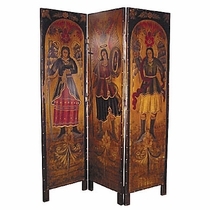 Assortment: The room divider screens in stock may be different than the images show. Scenes and subject matter vary from one shipment to the next. Your screen will be chosen from our current assortment. Also find our decorative tin door hangers and door ornaments that are hand crafted and hand painted. Click on the items below for details and ordering.